Download the images for this post. 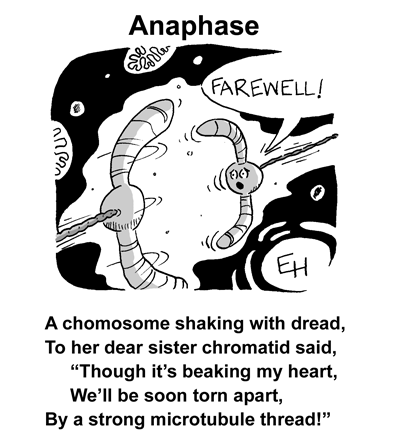 Here's the last in the series of mitosis limericks (see my previous posts on prophase, metaphase, and anaphase). I've used these in class to highlight important events during mitosis without showing cell images. Students will see high quality images of mitosis in in their textbook. I have to admit that Telophase is the weakest of these limericks primarily because...it really isn't about telophase! 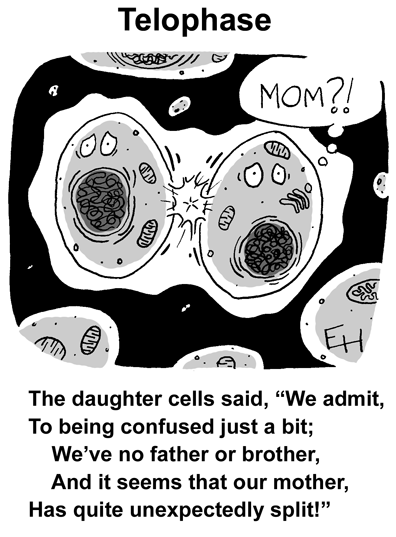 The poem really applies more to cytokinesis in an animal cell than to telophase. At least the illustration shows some of the important events of telophase. Specifically, the nuclear envelope reforms and the chromosomes relax into loosely coiled chromatin. Get on the Protein Train!